Spells, Books, Costumes, and Fun!!! I confess. I love Halloween. It’s my favorite holiday. You likely know this because of my spooky books and the pleasure I take in scaring you a little. It’s a family illness. To celebrate the season of witches, ghosts, and black cats, I have two new books out this year—and a special sale on another. Read on to get all the details—and to find out about the HUGE Halloween bash, costume party, bookstore opening, limerick contest, and much, much more. It is going to be the Halloween event to be at, either physically or virtually. First the books. 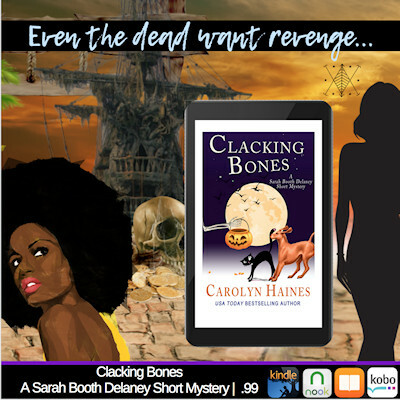 “Clacking Bones” is a Halloween short novella featuring Sarah Booth’s haint, Jitty, and a serious problem she’s having. Sarah Booth has to step up! It’s only .99 and will give you a “fix” of Sarah Booth until A GIFT OF BONES comes out October 16. 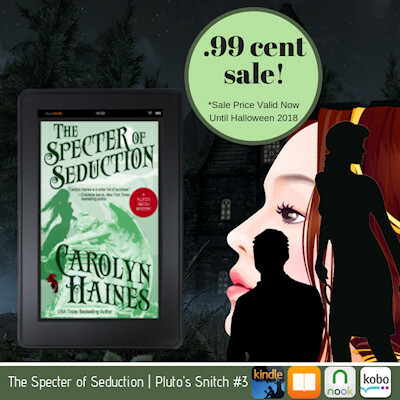 THE SPECTER OF SEDUCTION is on sale today for only .99! If you’ve read and enjoyed it, please consider gifting the e-book to a reader friend of yours. I hope the book “scares you good” and I hope you feel it’s a suitable Halloween pick! This month, SPECTER is the featured book pick in the Sleuthing Women Book Club. This is a really fun group so you might want to join. 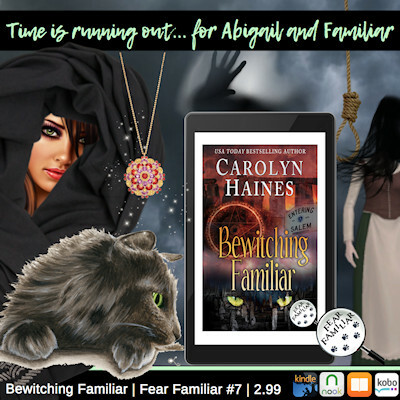 I’ve also reissued one of the most popular Familiar, black cat detective books, BEWITCHING FAMILIAR where the wise-cracking Familiar time travels back to 1692 Salem, Massachusetts to intervene in the Salem Witch Trials. 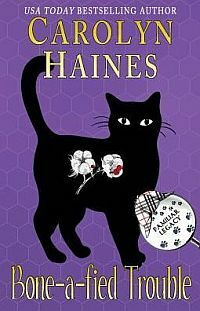 Familiar, who is a Sam Spade/Humphrey Bogart kind of cat, is a fine detective, and his son Trouble has spawned his own series—which brings us to the PARTY and the very naughty #madcatters! This is a big, big sprawling, fun party. The Mad Catters at the Haunted Book Shop. Cats, Costumes, and Chaos. In the real world, it runs from 3-9 p.m. Central, on Saturday, October 27, at The Haunted Book Shop on Dauphin Street in downtown Mobile. Of course, there’s a story about the book shop. Years ago, there was the original Haunted Book Shop run by Adelaide and Eleanor, two wonderful ladies who loved all books and befriended Mobile writer Eugene Walter. Eugene worked in the book shop for several years as he was writing his own novels, poems, plays, short stories, and music. Angela Trigg is a descendant of the bookstore duo—and she has reopened the store. So all things come full circle. 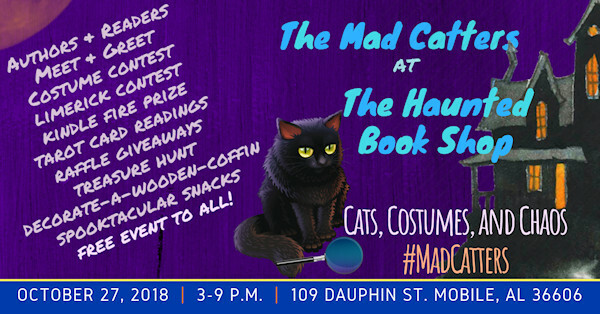 The #madcatters, under the direction of Rebecca Barrett and Susan Y. Tanner, (they each have two Trouble black cat books under their belt and other novels too! ), are hosting the Halloween party to celebrate books, black cats, bats, booze, and dancing in the streets. (If Darth shows up, I am so dancing!) Some of the other #madcatters will be there—the notorious Tammy Lynn and Hope Harrington Oakes (who is somehow related to YOU! She knows and is blood kin to everyone!) And we have our very special writer guests Miranda (Dean) James, who writes the Cat in the Stacks mysteries, and Lexi George, author of the Demon Hunting series. It is going to be non-stop fun. So here are some of our plans—we’re finalizing a bunch of things. DeWitt Lobrano will be at the book store to do free tarot readings for those who are brave enough to gaze into the future! There will be a spell writing contest—in the form of the limerick! That should make it interesting! To cast a black spell on a man; you need books that religions ban; brew eye of newt; into bubbling soup; and stir until you achieve your plan. Okay, so it’s not the greatest spell limerick, but you get the drift. And the big grand prize of a Kindle will be awarded to the best costume—so come dressed for fun! Those of you who live far away can participate in the costume contest by posting your photos online. We’ll require you to fill out a form that signs you up for newsletters from the #madcatters authors (but you wouldn’t want to miss out on our newsletters because we are wild and crazy and you will have fun with us!). We’ll extend the costume deadline until November 2 so that those who are not in Mobile but who dress up for Halloween can have a chance to compete. More info and links for the costume party and sign-up will be forthcoming. For those who are coming to the party, we’ll have Witches’ Brew and snacks and some Devil punch—alcohol free—for the younger generation. So plan your costumes, write your limericks, and prepare to PAR-TY. Remember, I’ve put a spell on you, so you have to obey. To put you in the mood, here’s one of my favorite songs. First is the Annie Lennox cover. The song was written by Screamin’ Jay Hawkins and he deserves the credit for it—and man do I love his version. Which one do you like? Here’s the Annie Lennox cover—which is freaking fabulous! And here’s the Screamin’ Jay Hawkins version, which I adore!